From an old jewelry store estate this is a gorgeous Never Used unmarked mid century Florenza red glass cabochon brooch with a strong antique finish to the heavy gold plating. As many collectors of these old Florenza and Goldette pieces know oftentimes it is either unmarked or the marking is more often underneath that thick gold finish. They were so heavily plated that oftentimes the markings were covered with gold. Florenza was well known for its mid century cameo and art glass jewelry. 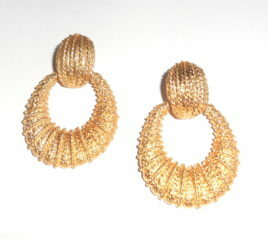 This piece has very fancy filigree with tiny cut work on the gold edges. Very intricate and well detailed. The red glass cabochon center is a 25.4mm large oval bubble with foil back and glowing red color. Given that this piece was a store display sample it has a little wear on the back foil. Other than this it is in perfect no wear condition. No chips. Not abrasions. No wear to the gold finish. No filigree damage etc…. The faux pearls are 2mm and the 2 black rhinestone accents are about 5mm each. Size of brooch north to south is 2 1/4″ north south by 2 1/8″ east west. Locking clasp is strong and works well. 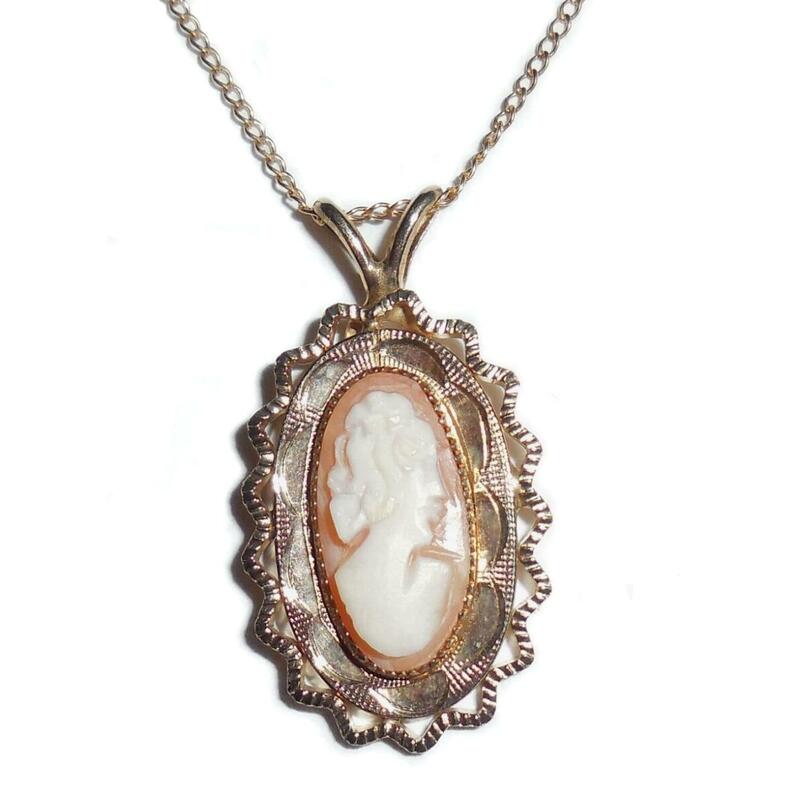 This is a gorgeous beautiful condition never used old store example of vintage Florenza cameo jewelry for your collection. 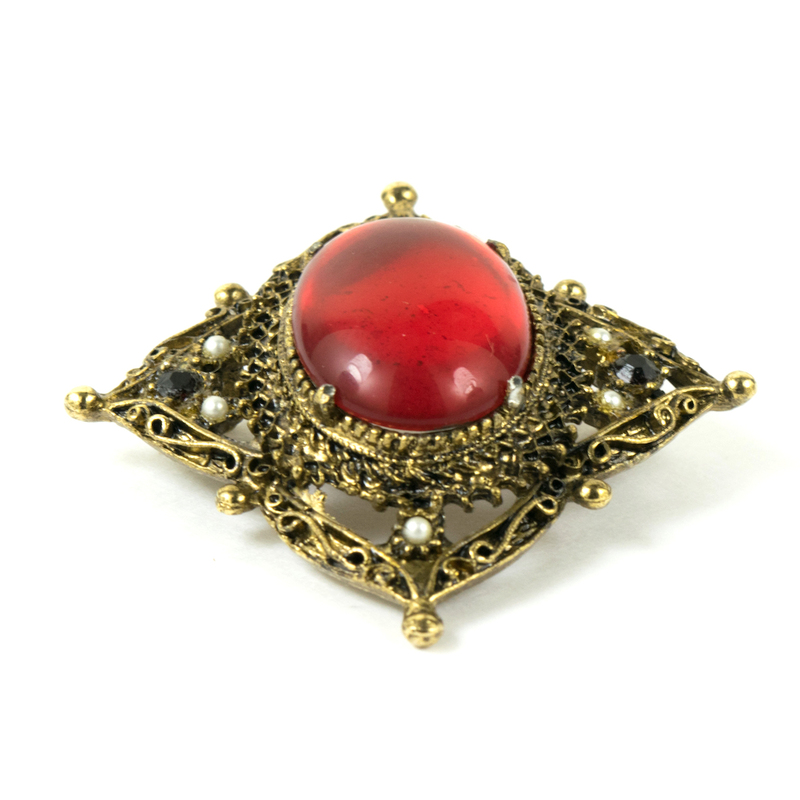 1960s Store Sample Vintage Red Glass Pearls Fancy Brooch Pin Large – From an old jewelry store estate this is a gorgeous Never Used unmarked mid century Florenza red glass cabochon brooch with a strong antique finish to the heavy gold plating. As many collectors of these old Florenza and Goldette pieces know oftentimes it is either unmarked or the marking is more often underneath that thick gold finish. They were so heavily plated that oftentimes the markings were covered with gold. 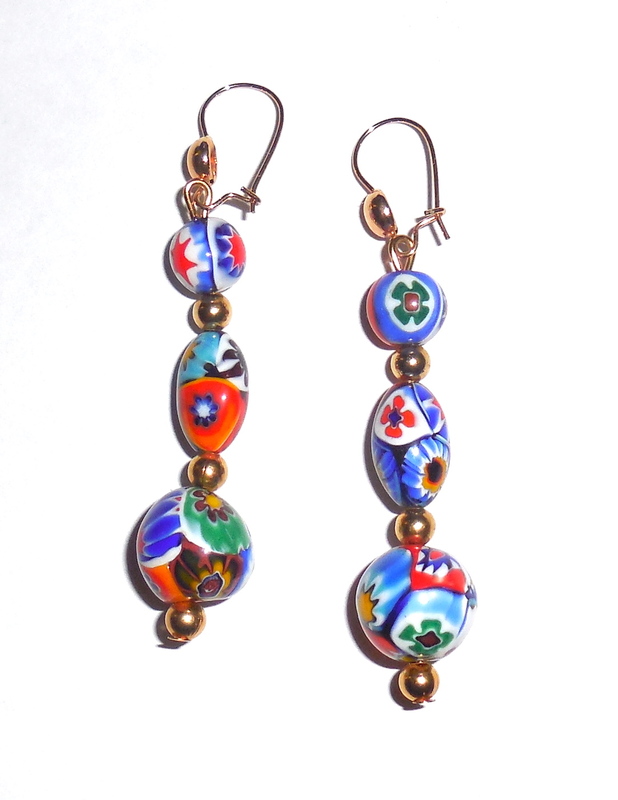 Florenza was well known for its mid century cameo and art glass jewelry. 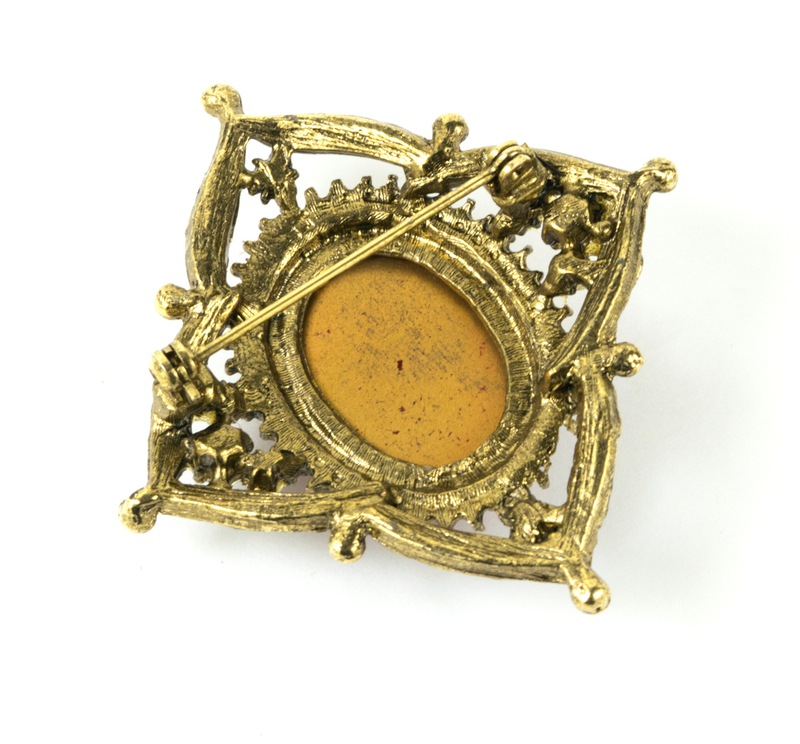 This piece has very fancy filigree with tiny cut work on the gold edges. Very intricate and well detailed. 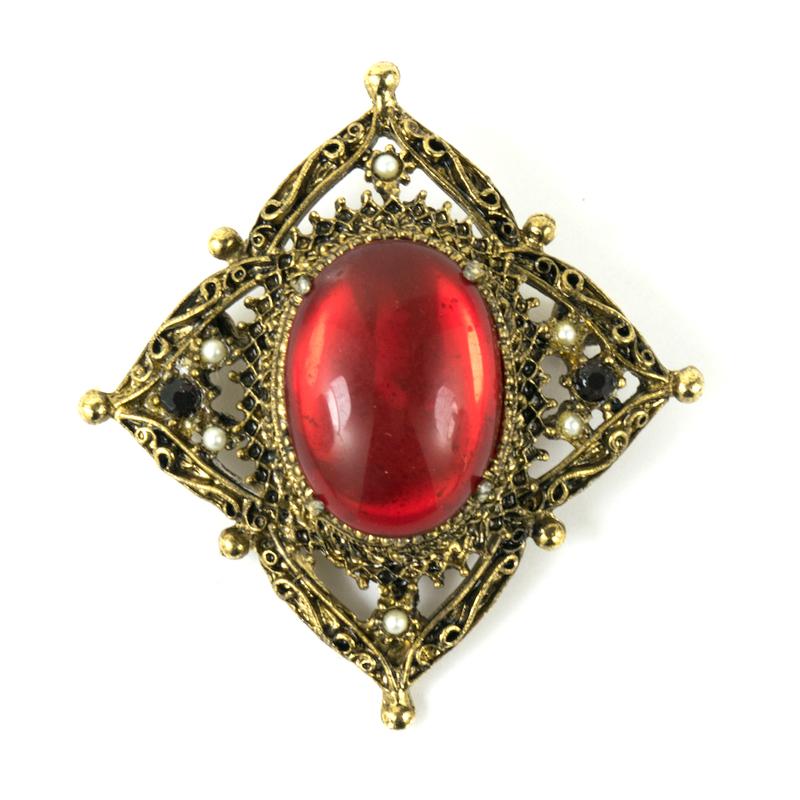 The red glass cabochon center is a 25.4mm large oval bubble with foil back and glowing red color. Given that this piece was a store display sample it has a little wear on the back foil. Other than this it is in perfect no wear condition. No chips. Not abrasions. No wear to the gold finish. No filigree damage etc…. The faux pearls are 2mm and the 2 black rhinestone accents are about 5mm each. Size of brooch north to south is 2 1/4″ north south by 2 1/8″ east west. Locking clasp is strong and works well. This is a gorgeous beautiful condition never used old store example of vintage Florenza cameo jewelry for your collection. 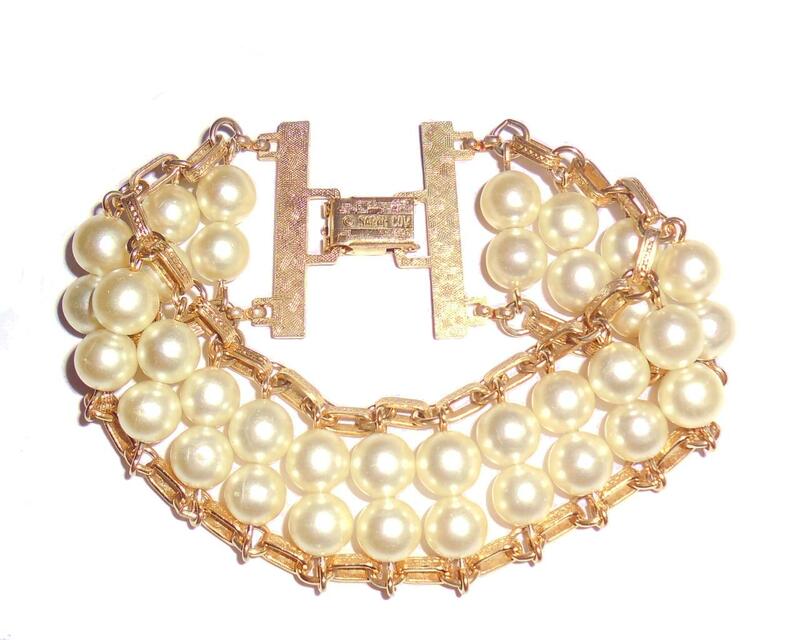 Florenza jewelry pieces are distinctive for their antique looks and resemble Victorian and Renaissance jewelry. Florenza Jewelry was initially designed by Daniel Kasoff whose original name was Kosovsky. He started off his career in the garment industry and it was chance that gave him an entry into the costume jewelry business. He was out dining when someone stole his coat. Mr. Speier was also in the same restaurant and paid him for a replacement coat. Kasoff repaid Speier the amount as soon as he was able, and Speier, impressed with his honesty offered him a job in Speier Costume Jewelry Co. There, Kasoff was able to gain experience in various aspects of the business and ten years later he branched out. He set up Kaywin Novelty New York in the 1930s along with Marty Weiner. He then set up his own costume jewelry company called The Dan Kasoff Company using savings he had accumulated by then. Florenza jewelry placed emphasis on quality and fine finish. This is what made marks such as Estee Lauder and Revlon choose to use their products and designs. Legacy Dan’s son Larry Kasoff continued to carry on the legacy of his father and the Florenza jewelry line was produced until 1981. Larry Kasoff was planning a new line of jewelry at that time when he was severely injured in an automobile accident. This forced him to shut shop and Florenza jewelry is no longer produced.